It's a no brainer that this "Culinary Christmas" theme would feature a version of the 12 Days of Christmas. You've got pear trees, geese, milk, and a bunch of other edibles. 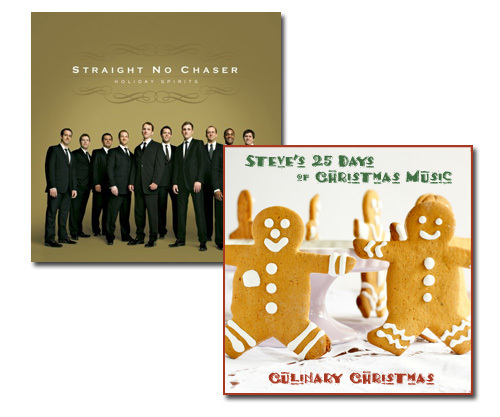 And if you've watched PBS in any capacity, you'll recognize today's artist, Straight No Chaser, as they have starred in numerous specials, usually designed to get people to contribute to their local station. After all, this programming is made possible by "Viewers Like You. Thank You." This a cappella group from Indiana University got their big break when a YouTube video documenting their 1998 rendition of "12 Days" was seen by millions in 2007, including an exec at Atlantic Records, who signed the 10-man group to a 5-record deal. Incidentally, the group's founder, Dan Ponce, is the son of Phil Ponce, who anchors the nightly show Chicago Tonight on our local PBS station here in Chicago, WTTW. Dan was working for our local ABC station before breaking out with Straight No Chaser and last year left the group to return to broadcasting, where he once again is working here in Chicago, this time for WGN as a reporter. This version of the song is rather fun because it combines a bunch of different Christmas tunes — and even throws our Jewish friends a little something to enjoy. Today's song has been recorded many times by the group, in both live and studio versions. However the version I'm featuring is actually the live audio from the YouTube video that was eventually seen by 11 million people and gave the group their big break. I don't mean to be contrary, but YouTube didn't even get started until 2005, so I don't think Straight No Chaser was discovered on YouTube in 1998. Friar, you are correct. The video was shot in 1998, but uploaded to YouTube in 2007. I've corrected the story to be more clear on the issue. Thanks!